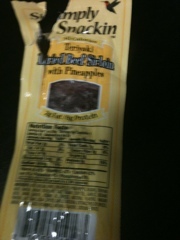 First snack of the day was Simply Snackin Teriyaki Dried Beef Sirloin with Pineapple. I wasn’t sure what to think of it when I first saw it, but it was actually very chewy and tasty. Only 50 calories.